Everyone is anxiously waiting for opening day Saturday, March 1st for a shot at some Rockfish, Lingcod, Whitefish and Sheephead. Mother Nature decided that we will all have to be patient for a few more days, as wind and rain have cancelled almost all trips along the coast. What a shame as most boats were booked solid for both Saturday and Sunday. Very surprisingly reports of a Hurricane building offshore. Thought you needed warm water for that condition to occur? The Coronado Islands on again, off again Yellowtail bite was off this week. However, way south down in San Quintin, Captain Kelly found the Yellowtail on the chew, mostly being caught on the Yo Yo iron style of fishing. There was a marked improvement in local action for the week, as both Sand Bass and Calico Bass along with Halibut fishing picked up. The Bonito bite at Catalina is still in play; however no sport boats are even running to Catalina to find them, only the private boater has enjoyed the fun. The Bonito are there, just no one fishing for them other than private boaters. Private boater Jonathan fished the island over the weekend and hammered the Bonito on light gear, with most fish released. 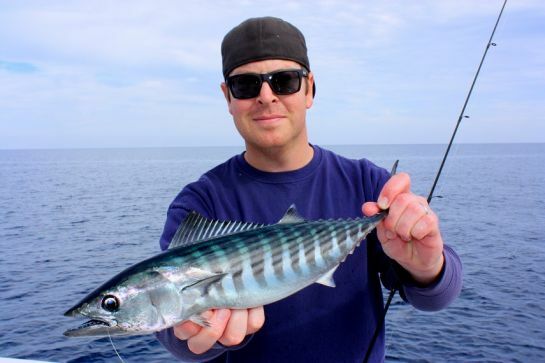 The Bonito were caught on anchovies and a variety of lures to four pounds. And paid for by us working folks! The weather forecast for both Saturday and Sunday is treacherous, so don't go out! The wind is expected to rise to over 30 knots in some areas, with huge swells, and there are reports of a Hurricane offshore in the Pacific. Always check the latest forecast before leaving the dock. You gotta love the border patrol sign. But that's are government for ya.great post as always, thanks.